the author, it's what we're all after. What writers are trying to do is write something that'll eventually have a life independent of the author." (Daily Iowan, 9-30-88, Kevin Goulding; Iowa City Press Citizen, 12-11-86, Lynda Leidiger). Conroy has taught at Brendeis University, MIT, and George Mason University. His stories and articles appear in New Yorker, Esquire, Partisan Review, Harpers, New York Times, and numerous anthologies. He lives on Bowery Street. Henry Coulette, student '52 UI Writers' Workshop. While a teacher, poet and editor at UI, he lived at the Iowa House. He received the Lamont Poetry Selection Award from the Academy of American Poets in 1965. "...I accepted the fellowship Paul Engle offered me in 1952. I was a long way from California. I was homesick, heartsick, and too broke to go home. So began the happiest years of my life....The university, then, did what universities are supposed to do. It made the idea of itself manifest: there were these men and women, and they read these books, and and they talked about them, and they wrote these poems, and they read them to each other." With editor Paul Engle, and co-editor Donald Justice, Coulette published Midlands, 1961, an anthology of 600 pages of poetry and fiction by people who had been students in the first 25 years of the Writing Programs at The University of Iowa. 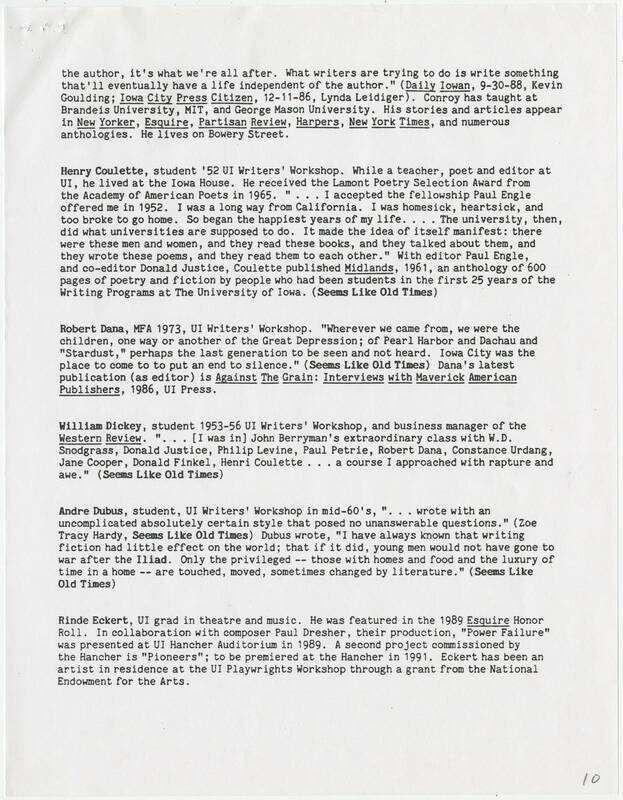 (Seems Like Old Times) Robert Dana, MFA 1973, UI Writers' Workshop. "Wherever we came from, we were the children, one way or another of the Great Depression; of Pearl Harbor and Dachau and "Stardust," perhaps the last generation to be seen and not heard. Iowa City was the place to come to to put an end to silence." (Seems Like Old Times) Dana's latest publication (as editor) is Against The Grain: Interviews with Maverick American Publishers, 1986, UI Press. William Dickey, student 1953-56 UI Writers' Workshop, and business manager of the Western Review. "...[I was in] John Berryman's extraordinary class with W.D. Snodgrass, Donald Justice, Philip Levine, Paul Petrie, Robert Dana, Constance Urdang, Jane Cooper, Donald Finkel, Henri Coulette...a course I approached with rapture and awe." (Seems Like Old Times) Andre Dubus, student, UI Writers' Workshop in mid-60's, "...wrote with an uncomplicated absolutely certain style that posed no unanswerable questions." (Zoe Tracy Hardy, Seems Like Old Times) Dubus wrote, "I have always known that writing fiction had little effect on the world; that if it did, young men would not have gone to war after the Iliad. Only the privileged -- those with homes and food and the luxury of time in a home -- are touched, moved, sometimes changed by literature." (Seems Like Old Times) Rinde Eckert, UI grad in theatre and music. H was featured in the 1989 Esquire Honor Roll. In collaboration with composer Paul Dresher, their production, "Power Failure" aws presented at UI Hancher Auditorium in 1989. A second project commissioned by the Hancher is "Pioneers"; to be premiered at the Hancher in 1991. Eckert has been an artist in residence at the UI Playwrights Workshop through a grant from the National Endowment for the Arts.